Make your home warm and inviting this holiday season with a few easy, personal touches. What is the best way to convert recessed can lights in my entry and hall to recessed spotlights, so I can highlight the artwork along the walls? Replacing your existing can lights is not difficult. An experienced electrician can do it with ease. First, determine what type of can is currently installed by removing the bulb, and gently pulling down the trim/reflector inserted in the can. When the trim/reflector is removed, a label with the brand name and model number should be visible inside. That information will enable you to find a proper replacement trim that is adjustable and will provide the desired accent lighting. Dim recessed lighting, and adjust accent and cove lighting to create highlights and drama. Focus attention on a tree and other holiday decorations with portable spotlights, which can usually accommodate a table top dimmer. Create pretty silhouettes by placing a spotlight beneath a Christmas tree so that it shines up through the branches. Switch out a few lampshades. Replacing a neutral lampshade with one that is red or gold will soften the light and create a holiday atmosphere. Fill a corner with a basket of children’s holiday books. Create an elegant ambiance in the powder room by adding some simple touches, such as a portable lamp with a colored shade, bright flower arrangement, holiday towels or scented candles. Take an overall look at your home, and visualize it as a guest. Notice what stands out and what areas need additional attention. Your guests will surely appreciate the extra effort. While lots of lights and decorations is eye-catching and glorious, it is not necessary for creating an elegant and welcoming first impression for your guests. 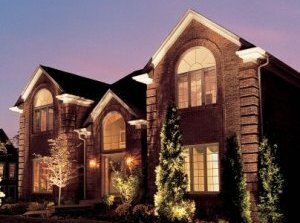 By adding a few, easy-to-install landscape uplights to highlight trees and shrubs, or path lighting to illuminate a sidewalk or driveway, your home will emit a sense of understated warmth and sophistication. During the holidays, prudent use of red or green bulbs in landscape lights is an effortless way to add a festive touch. Don’t be intimidated by the idea or installing outside lighting. Low-voltage landscape lights are very simple to install.